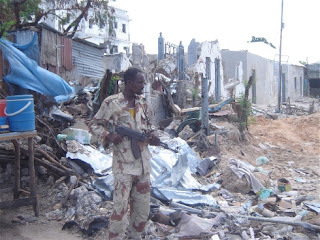 Cape Town, 17 October 2008 (biikole.blogspot.se) - About 200 Somali businessmen in South Africa's Western Cape Province are being threatened with violence if they continue doing business in the townships. They recently returned to the areas after fleeing a wave of xenophobic attacks in May 2008. A group of local township businessmen, acting under the banner of the Zanokhanyo Retailers Association (ZRA), sent the Somalis letters in September, warning them to close their shops or face "actions that will include physically fighting". Somali businessman Mahad Omar Abdi, 33, who owns a supermarket in Khayalitsha that was looted during the xenophobic attacks, told IRIN the threats were being taken seriously. "The letters have caused fear and mistrust in the township's [Somali] business community and it shows the vulnerability of foreigners who want to come back to the communities they left last May. However, we believe this is more a criminal element looking to move in on our businesses, rather than the whole community disliking our presence here, so we are not prepared to just let them take everything from us," he said. Thousands of Somalis fled their homes and businesses after xenophobic violence, which began in the Johannesburg township of Alexandra, spread throughout the country and claimed at least 65 lives, while displacing tens of thousands of people. Some South Africans claim that foreigners are responsible for the high crime rate - although there is no empirical evidence for this - are taking jobs, and bribing government officials to be first in line for state housing. Somalis began arriving in South Africa in the mid 1990s after civil war broke out in their country in 1991, and have probably been singled out for attacks more than any other African migrant community. According to representatives of Somali's Western Cape community, these attacks have increased in frequency and ferocity over the past five years, to the point where hundreds of their countrymen seeking refuge in South Africa have been murdered. In August Mahad Abukar Alasow, 26, a Somali who had returned to Khayalitsha after staying at the Soetwater safety site established in the wake of the xenophobic attacks, was killed by a group of people said to be robbers. A local Western Cape newspaper, The Cape Times, said Alasow was shot three times and died at the scene, but nothing of value was taken from his shop, prompting speculation that he was targeted because of his nationality. The May xenophobic attacks in Western Cape Province displaced about 20,000 foreign nationals and there are still about 1,400 living in camps around Cape Town, the provincial capital, because they are too afraid to reintegrate into township communities. Last month a Somali woman and her three young children were murdered in the Eastern Cape Province town of Queenstown, with the viciousness of the attack prompting the United Nations Human Rights Commission conduct an investigation. UN Human Rights High Commissioner Navi Pillay condemned the acts and acknowledged the increase of attacks on Somalis. "There appears to be a dangerous pattern of targeted attacks on foreigners, especially but not exclusively involving Somalis," she said. ZRA chairperson Sydwell Citwa last week told the Mail and Guardian, a local weekly newspaper, that businessmen in Khayalitsha wanted Somali shops to be closed in the short term. "While we're talking to them, we want them to stop operating. Our problem is simple: We are hungry. We are angry. And the Somalis are undercutting us. "These people come into the country with nothing, and the next minute they have stocked shops and fridges. We've done our research and we know that the Muslim Judicial Council [MJC] is helping them because they're Muslim. "We also want help from our government because we gave them power. We are the ones who fought for freedom and democracy, and now these Somalis are here eating our democracy," he said. Abdul Fattaag Carr of the Muslim Judicial Council of South Africa denied that the organisation was funding the Somalis in the Western Cape, but said the council was helping foreigners adversely affected by the xenophobic attacks. "This is more about a fight for scarce resources than a case of outright racism against Somalis, but because their traditions and culture are very different to South Africans' they stand out more than other foreigners and are viewed with suspicion. "Somalis are good business people and they are very united as a group. They approach suppliers as a group and buy in bulk so they can get the cheapest price possible. This is why they can offer their goods at a lower price to the average South African operating a shop in the townships," he told IRIN. Cape Town city officials intervened after the media attention the ZRA and the Somali community received over the threats, and chaired a meeting between the groups that has defused the situation for now, Abdi said. But the Somali community was still vulnerable because of the differences between Somalis and other cultures, said Alas Jama, 43, a Somali from the Cape Town suburb of Bellville. Although his countrymen had integrated well when it came to establishing businesses in South Africa's townships, many preferred not to weave their lives into that of the local community. "Because we are Muslim, many Somalis prefer to marry amongst themselves because of the sensitivities associated with mixing cultures," he commented. "Somali people's culture is very different to those you find in Southern African communities and this leads to problems. Many Somalis don't feel comfortable taking on local cultural traits, which has the affect of alienating them to some degree," said Jama, who helped coordinate relief efforts during the xenophobic violence. "Because other Africans from around the region have integrated better with the South African communities in terms of living amongst and marrying locals, they were the first to be targeted by the mobs that took over," he said. "Somalis created their own jobs, opened their own shops and stayed amongst themselves, and this really helped them to be spared during the killings here at that time," Jama said. "They lost property and had shops destroyed, but it was those who had integrated best who suffered the most from violence, because they initially felt safe and did not leave in time."